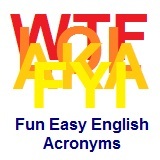 ﻿ Fun Easy English - new american english standard acronyms internet cyber slang chatspeak netspeak shorthand translexical phonological abbreviations numbers symbols miscellaneous. In this lesson you will learn American English standard acronyms beginning with numbers and symbols. ;S What did you say? Hey do you know any English acronyms used in texting, instant messaging, and social networking websites beginning with numbers and symbols not listed on this page?